This is my fifth year in a row exhibiting at San Diego Comic Con. 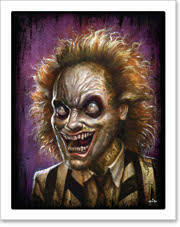 This year, I’m teaming up with “Ghoulish” Gary Pullin, a legend in the world of the art of horror. I’ll be in the SciFi/Fantasy Illustrators section again this year, in booth 4619. I have several exclusives available for the show, mostly in the hand embellished department, though I will be debuting a brand new print. I’ll also have some sold-out rarities and a couple other surprises each day. I will be doling everything out a little each day starting on preview night (Wednesday), so if you miss out on one day be sure to check back another. For those buying for someone else (being good Poster Buddies), unfortunately you will only be allowed to purchase one of the super rare items. This will be strictly enforced and there will be no sales before the show. In the past, these items have gone extremely quickly, so you’ve been warned! I’ll be doing very limited convention sketches this year, so if you’re interested, get to me early and hopefully I won’t get too backed up. I’m very excited for this year’s Comic Con. I’m looking forward to showing what I’ve been working on, as well as seeing friends and new faces alike. It’s always wonderful to meet face to face with those of you who support my art, plus it’s great to be able to see friends I only see during the Con. It’ll be a real joy to show with Gary Pullin as well, as he’s just an all-around great guy. Without further adieu, here’s the full listing on all the gear! See you soon! Print size: 18″ x 24″ edition of 50. 9 color screenprint on pearlescent stock. Available exclusively at SDCC, any remaining prints will go up in the store after the convention. Print size: 24″ x 36″ ONLY 5 AVAILABLE. Hand embellished with ink and acrylic on 8 color screenprint. $450 each. STRICT LIMIT OF ONE PER PERSON/PURCHASE! Various colorways, all uniquely hand embellished. Hand embellished with ink and acrylic on 2 color screenprint. $400 each. STRICT LIMIT OF ONE PER PERSON/PURCHASE! Print size: 12″ x 18″ ONLY 10 AVAILABLE! Printed on Stonehenge printmaking paper. $75 each. STRICT LIMIT OF ONE PER PERSON/PURCHASE! Archival giclée print on 100% cotton, print size: 18″ x 18″ ONLY 10 AVAILABLE! $5 per pack. No limits. Go crazy!